With an abundance of over 1100 species of birds, Kenya is quickly becoming a favorite birding hot spot among birders and nature lovers from across the globe. Wild safaris and travel, the specialists in Nature Tours and Expeditions in Kenya, arranges Birding Expeditions to all birds destinations including lake Nakuru, Bogoria and baringo, Kakamega and all the bird rich in kenya. Our tour guides are knowledgeable experts on local birds ensuring you a great birding experience, exciting bird sightings, and unique way to see Kenya. 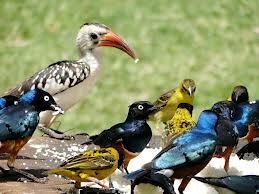 wild safaris and travel is an experienced Kenya tour company, offering small and personalized bird watching tours. We cater to all sections of birders. Our tour packages range from specialized birding tours in Kenya. Let wild safaris and travel be your guide to the fascinating world of Kenyan birds. Kenya's national parks make excellent centers for bird watching in Kenya - the Maasai Mara for the rosy-throated long claw and magpie shrike; the Samburu for the rare shining sunbird and pink breasted lark; and Nairobi for the northern pied-babbler and Pangani long claw. Kenya' handful of endemics include the Tara River cisticola, the Aberdare cisticola; Hindi's pied-babbler; William's lark; Sharpe's pipit; and Clarke's weaver. This diverse range of habitats supports a great diversity of bird species - and makes a bird watching holiday in Kenya very rewarding! For some of the better lodges and camps for birders in Kenya.